*President Barack Obama on Monday unveiled a compromise deal to extend all Bush-era tax cuts for two years, giving ground to emboldened Republicans who won big in last month’s congressional elections. After meeting Democratic leaders at the White House, Obama announced a “framework” agreement with Republicans that would renew tax cuts not just for the middle class — as he and fellow Democrats had sought — but also for wealthier Americans, as Republicans wanted. The tentative plan is expected to draw resistance from some liberal Democrats, who have expressed disappointment that the president was bending to Republican demands while not gaining enough in return. 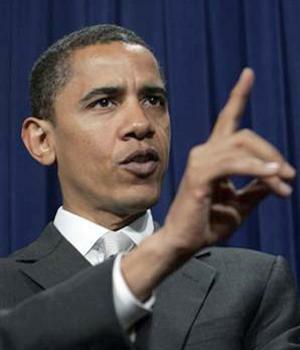 Obama might need Republican help to pass the package if enough of his fellow Democrats revolt. The tentative tax-cut deal, which is expected to extend breaks on dividends and capital gains as well, also calls for a 2 percent employee payroll tax cut and a 13-month extension of unemployment benefits, which could placate some Democrats. Obama said he had made some concessions because of the urgent need to reach a deal before Congress adjourns this month to avoid allowing the middle class to face higher taxes when all of the Bush-era cuts expire on December 31. Extending all the tax cuts for two years would cost $501 billion, according to the congressional budget office, at a time when Obama is under pressure to cut the $1.3 trillion budget deficit. The CBO said renewing the rates will boost the economy in the short term but be harmful in the long term. Obama’s concessions reflected a new political reality. Republicans gained the upper hand in the tax fight after scoring big gains in the November 2 congressional elections, which were seen as a verdict on Obama’s handling of a stumbling economy and persistently high unemployment. Obama’s tax proposal was still likely to meet some resistance from Democrats in Congress but analysts believe it faces a good chance of ultimately being approved before the end of the legislative session. Most Democrats have made clear they prefer to extend the lower tax rates for individual income up to $200,000 only, while Republicans have pushed for also keeping tax cuts for people who earn far higher incomes. “We support extending tax cuts in full to 98 percent of American taxpayers, as the president initially proposed. He should not back down. Nor should we,” Welch said in a letter to Democratic House Speaker Nancy Pelosi. Defending Obama’s approach, administration officials stressed that the extension would be nearing expiration again when he is seeking re-election in 2012. They believe he will then be in a stronger position to make the case to voters for blocking further tax cuts for richer Americans. Jim Manley, spokesman for Senate Majority Leader Harry Reid, said Reid would discuss Obama’s plan with the Democratic caucus on Tuesday. Some liberal supporters have accused Obama of being too willing to compromise in the tax battle. New York Times columnist Paul Krugman wrote that Obama should simply let taxes rise for all Americans rather than agreeing to allowing tax cuts to continue for the wealthy. Obama insisted that unemployment insurance be extended for those out of work as part of any tax deal. Unemployment payments, which had already been extended by Congress for to up to 99 weeks from a traditional 26 weeks, expire this month for two million Americans whose benefits have now run out. The deal outlined by Obama includes a two-year extension of a package of tax breaks for individuals and business. There was no immediate word on whether “Build America Bonds” — taxable debt included in last year’s stimulus plan and due to expire at the end of December — would be included in a final tax-cut deal. An administration official said the details were still being worked out. I heard his speech that if nothing was done taxes would automatically increase Jan. 1 by $3000 for everyone under George Bush’s plan; and he couldn’t allow that to happen in these times. Therefore he compromised by giving the wealthy rich a (large???) tax cut & everyone else for 2 years. The Haves and Haves More will stronghold him again, if they can, under expiring bills to get what they want with no consideration for the damage they cause the economy. This time under a democratic President. There has got to be a better way to stop them. Amend the constitution. There is no other democracy in the world where it is so difficult for the majority party to pass bills. The founding fathers idea of having so many checks and balances was a recipe for disaster. They were naïve men who didn’t take into consideration the possibility that the blk man would eventually get the vote, causing angry yts to even vote against their own self interest in order to put in office the degenerate lot now passing as Republican lawmakers. I mean, can you imagine an elected official willing to abandon so many citizens, with no source of income, who will have to resort to living hand to mouth on the streets. While at the same time we have a government burning $200 billion a year on senseless wars, that will only lead to more insecurity and inconvenience at airports? I understand why he made the choice that he did. But I am not happy about it. Though I am sure he did, it doesn’t look like he put up a lot of resistance. Still, he is the first person of color to hold this office. Many of the rules are being written as we go along. I will vote for him in 2012, but, with a lot less enthusiasm. I gave him space in the last 2 years to try and fulfill on his goal to change the tone in Washington D.C. That was never going to happen overnight, but, he is starting out the 2nd half of his term, with much of the same compromising b.s. that has only made him look weak. You think he put up a fight? Really? The same fight he gave by ordering a federal pay freeze before he even had a meeting with them? He GAVE that way just like he’s GIVING those tax cuts away. If the dems (enjoying majorities in all houses) sorry asses can’t stand flat-footed and box over the fact that Repubs are holding unemployment benefits hostage in favor for deficit adding tax cuts for the wealthy, then we need to change the game. Don’t buy into this “he had to” bs. He didn’t have to. He chose to, foregoing one of his clearest campaign promises. But this is the end result of many of his supporters “forgiving him” until the next time. He had to do this to beat Hillary. He had to beat McCain. He hasn’t even been inaugurated yet. He hadn’t even completed a year. He had to becuz of the midterms. He will have to because of 2012. Then he will have to cuz of 2014 (gotta keep a dem in the white house). Then, he’s outta there! Musb, I totally agree with your assessment. We are also to blame because we refuse to put the President’s feet to the fire because he’s the ‘first Black President’. While I do believe that he get some unfair shots in the media and his political opponents, I’m also not entirely surprised that he has punked out the way he has. But he does not have to worry about being challenged because we are still stuck in symbolism mode instead of substance. Some black folks are willing to go broke and homeless to support the President’s wage freezes and every damn thing else. 🙄 Straight up insanity. BTW, I will give him props for signing the bill for the black farmers. It’s been long overdue! Is it me or does it appear that he helps the Republicans because he will benefit as a high wage earner too? I’m on the verge of being done. The extension of the Bush era tax breaks esssentially happened because the pres wanted to extend unemployment benefits. So the GOP held it hostage against extension of the Bush era tax breaks for ppl making more than $250,000. The premise that the GOP is putting out there is that those ppl are the ppl creating jobs. NOT! The country cannot afford this. While I believe the tax breaks should have been extendedd to the middle class, I am against the breaks being extended to the wealthy…this is a real case of the rich getting richer, and the poor becoming poorer. I’m not happy about the president’s decision here, and he’s getting the side-eye from me. The GOP said their primary goal is not to approve anything put forth by the president unless he gives them what they want. If I wanted the GOP in charge, I would have voted for McCain. I wonder how the middle and lower-class and unemployed whites who voted for the GOP and T Party feel that they want to extend tax cuts for the rich while eliminating benefits for those out of work? If Dems have any integrity left at all, they better not let this happen. Filibuster, do whatever you have to do. This is fiscal insanity multiplied.